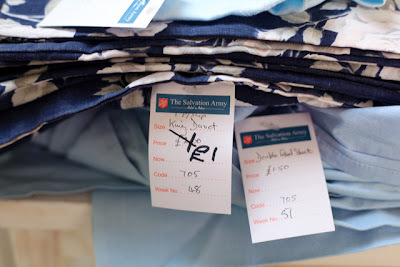 I was chatting away to a friend about bargain hunting and happened to mention I'd picked up quite a pile of bed linen and a table cloth for next to nothing from a charity shop, she shuddered and said she couldn't ever buy sheets or fabric second hand as 'you don't know where they've been'. Good point I suppose but who buys sheets, new or old, and uses them without bunging them in the washer first? Well - excepting the other half who got a reputation (unfair) for painting himself blue to get out of lectures when really he'd just slept on new sheets without washing them while suffering from Fresher's Flu and had some dye transfer issues! 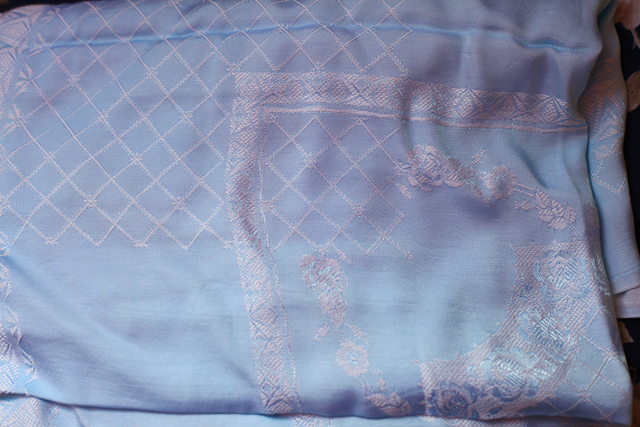 I like having a good rummage through the fabric rail as there are often some pretty pillow cases or even odd curtains, this tablecloth was £1.50, a little small for our kitchen table but I loved the light blue colour and the white detailing. I picked up a single flat sheet for £1 in light blue which I'm planning to butcher for some bunting and cushion covers when I've dusted off the sewing machine and a double fitted sheet in the same shade for £1.50. The biggest bargain, quite literally, was the king sized floral duvet cover and pillowcase for £1 - I like florals but I'm not the world's biggest fan so I was surprised when it jumped out and screamed 'pick me!' - any ideas how I should use it? Is it wrong that I love the softness of old sheets? It seems to take forever to get the same texture with new bedding! Well, heck of course you wash them first! I'm weird in that I don't buy clothes at the thrift store (had to wear hand me downs most of my childhood), but anything else is fair game. Cute blue sheet story! ROFL @ your OH and his blue sheets !! I could never buy/use a second-hand mattress but anything else is fair game! I love the softly worn feel of vintage linen and it's usually much better quality than even expensive linen available today. Smiling at your story of your OH and his blue sheets. I've lived with hand me downs most of my life so have no qualms about second hand linens.I am in love with that blue tablecloth! If you wash your items, then who cares if someone has already used it...I buy used linens and clothes all the time...just run them tru the washer first. im like you, love to rummage through the fabrics rail in charity shop! and yours are much more cheaper ranging from £1-£1.50, here i got it at least £2-£2.50 upwards! but i do like to make them as cushion covers or for the plain white ones, for experiment, heart shape hangers or frame them if i found the patterned ones such as floral! i wish i had a sewing machine, would make my life easier! i say, even the new bedding, i like it washed first to get it soften a lil bit, so what's the difference with the second hand one? i love charity shop! 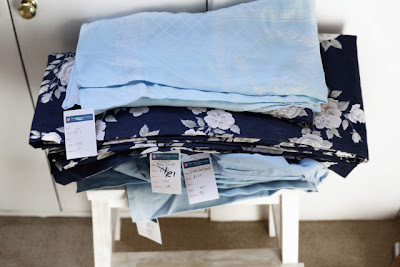 oh im also a fan of the fabric section in the charity shops its all a quid in my local im sure you seen my post last week ;) nowt wrong with 2nd hand fabric etc it al goes in the wash and aslong as no ahemmm stains or anything dont see the problem!! only thing i would never buy is cushions/pillows/matteresses as they cant really be cleaned. I love soft sheets! 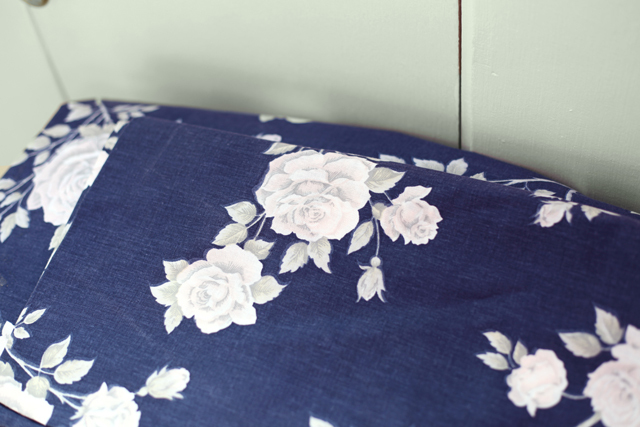 love your buys, the blue and white flower kingsize set is gorgeous :) you could use it for garden cusions and bunting! Thanks for your lovely comment on my table, I waited 24 hours between painting each coat then left the table for about a week to harden before sanding down. Done this before on other projects but learnt the hard way by sanding too early which means the paint just rubs up going rubbery! I use my little drawer for table cloths. You can't beat the appeal of old fabric prints! Good finds! Oh total score! You're totally right, it's not like you're sleeping in them unwashed...Who knows where they'll end up...maybe some pillow covers...maybe some wallcovering...who says sheets and linens have to go on a bed anyhow right :D Can't wait to see what you do with them!